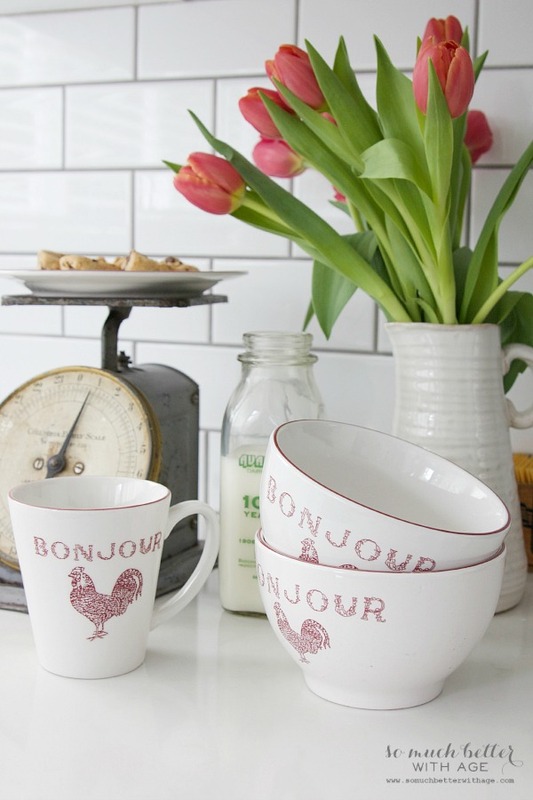 I am very excited to share with you my new French additions to my home! Disclosure: Thank you Kirkland’s for the gorgeous new French additions, all opinions are 100% my own. 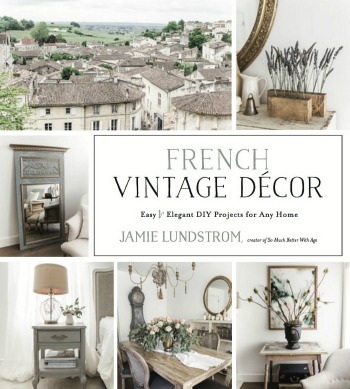 I’ve been adding new additions of French vintage around my house here and there. 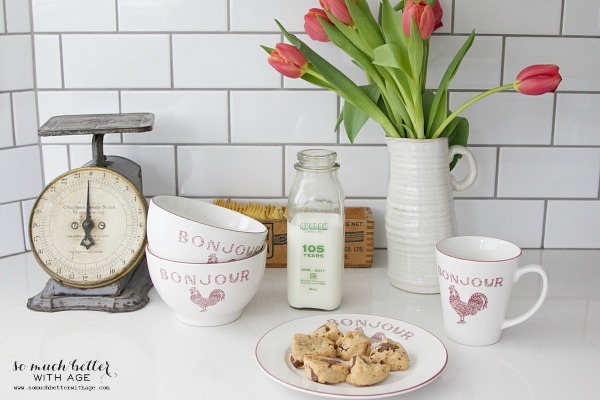 I recently picked up some French finds at Kirkland’s and I’ve teamed up with a bunch of amazing bloggers to share ways they’ve added spring into their homes. If anyone knows me, they know I don’t like red but I fell in love with these French bonjour dinnerware pieces from Kirkland’s. I even found tulips that matched. These soup bowls are the best size. 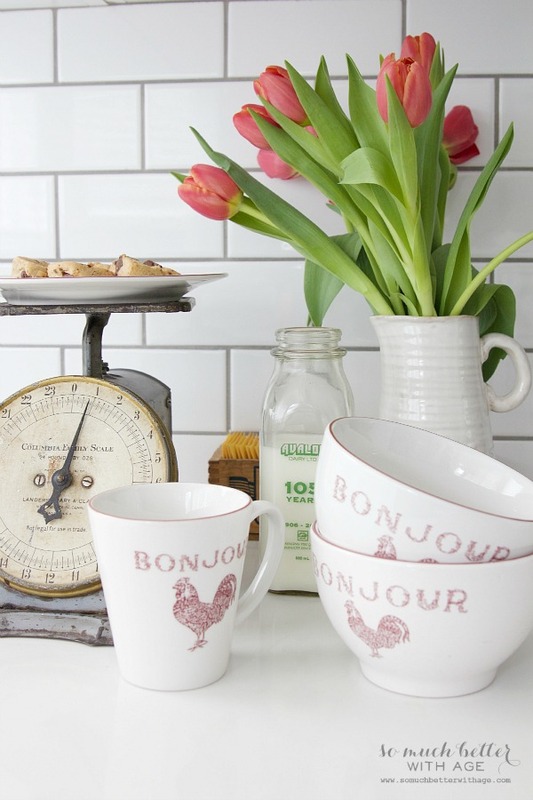 I clearly have a thing for French items and dinnerware or china. The other French item I found was this quatrefoil clock. 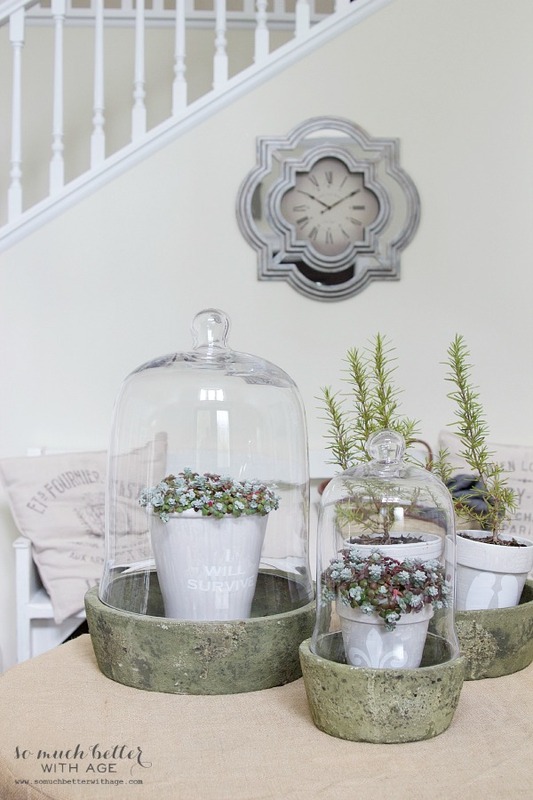 It’s so pretty in my foyer with my French glazed pots. I can’t believe they survived outside for a whole year. Here are some more spring areas of my home. 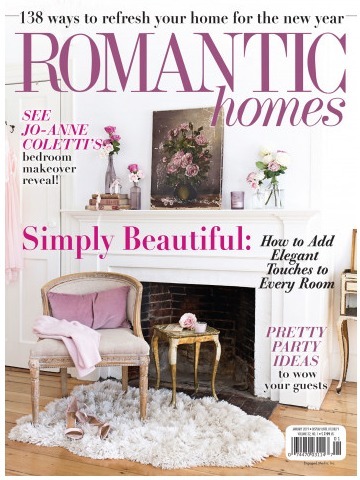 Check out the amazing blogs that are part of this home tour! Such gorgeous pieces! Love the rooster dishes and those cloches!!! Great finds. 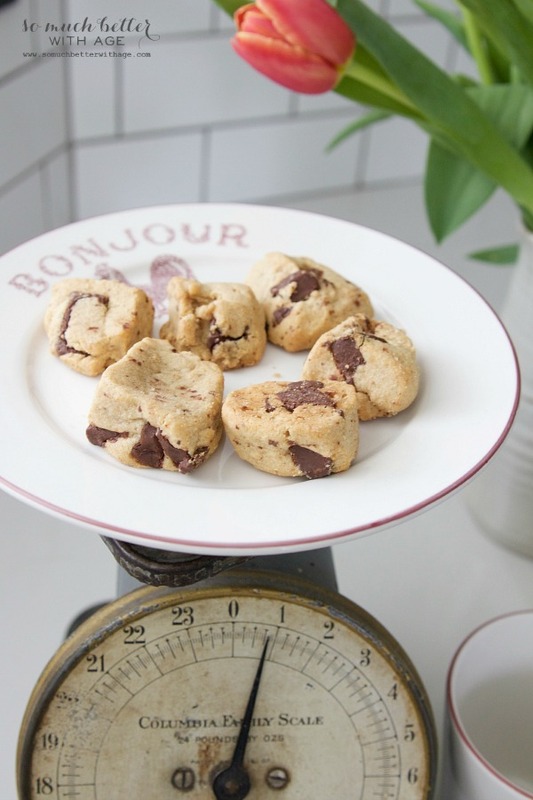 Love those dishes – so you! LOVE your tour, Jamie! 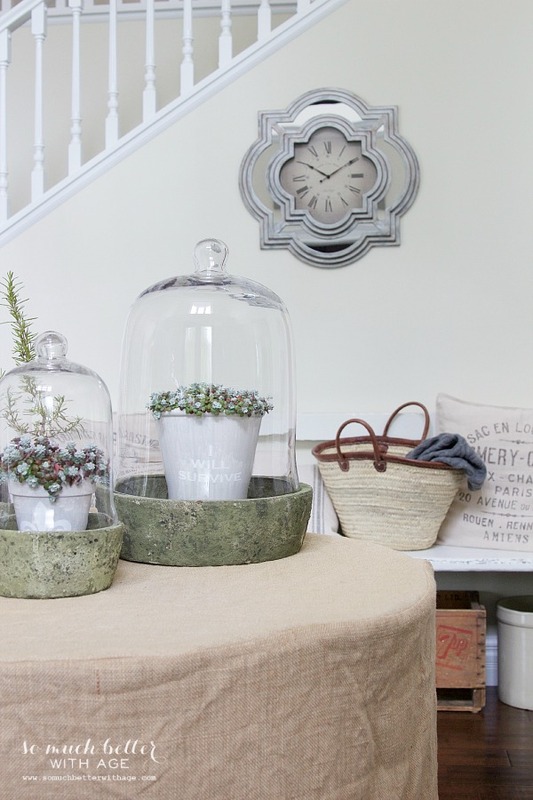 Those terrariums are gorgeous!!! Looks great Jaime. It’s so nice to see signs of Spring! Jaime, your home is beautiful! The hyacinths in the terrarium are gorgeous!!! So pretty!! Love the dinnerware! I have several roosters in my house!! So pretty Jamie. Such a tease with the milk and cookies! Gah, I am just obsessed with every photo! I had to scroll back up a few times just to soak it all in. So lovely. Thanks for sharing! Very pretty! I love quatrefoils so I absolutely love that clock! Your home is beautiful. Such pretty images from around your home. I can’t pick my favorite from among them. 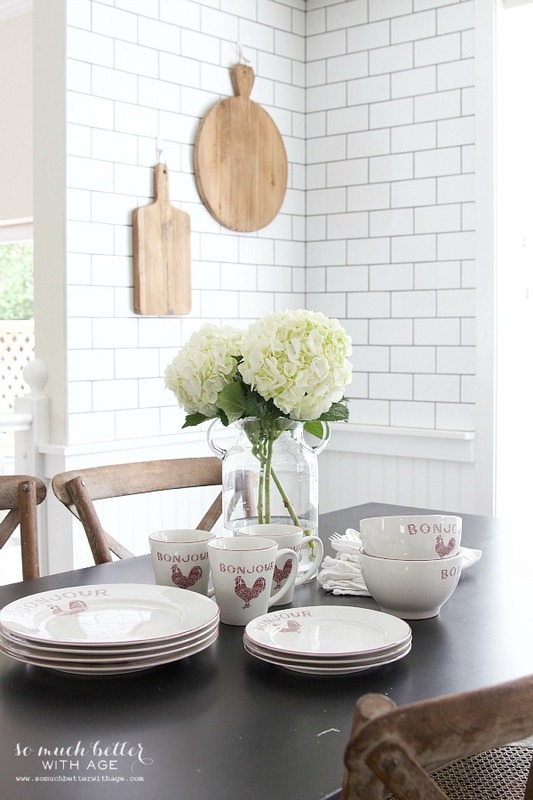 I absolutely love the subway tile on the walls of your kitchen. The bread/pizza boards are just perfect hung up against them, I love that mixture of textures. 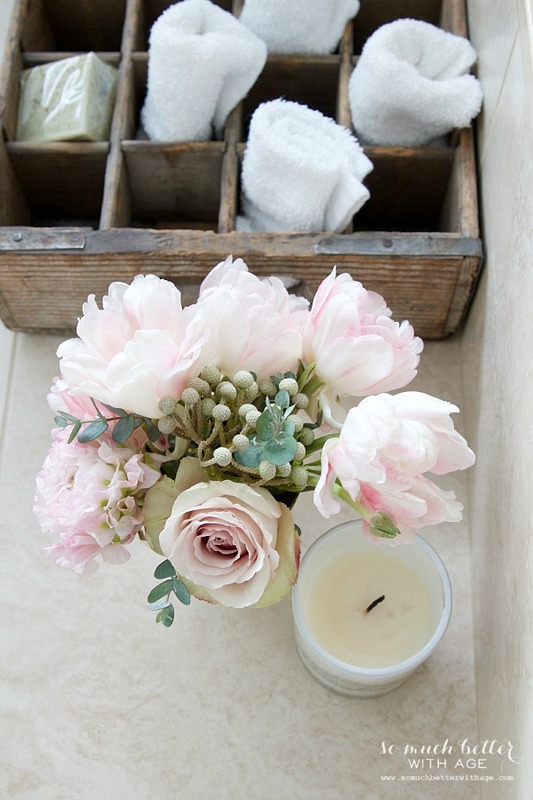 Everything looks so welcoming and springy! C’est magnifique!! 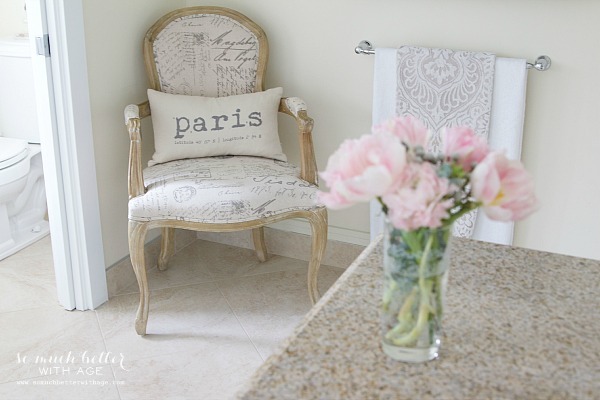 What pretty French inspired Spring touches!! 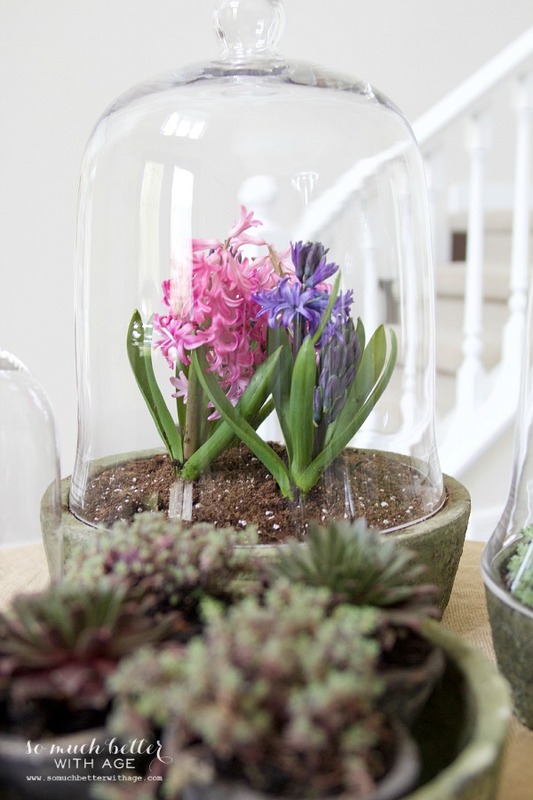 Love the Hyacinths under glass. They look extra gorgeous. 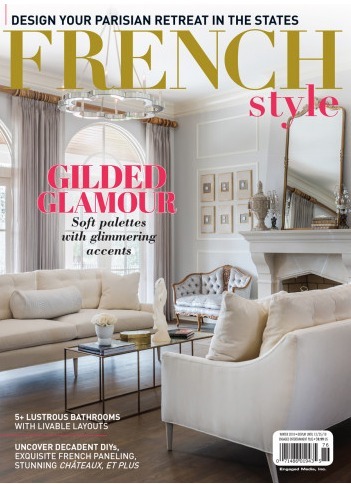 I have a thing for French stuff too! 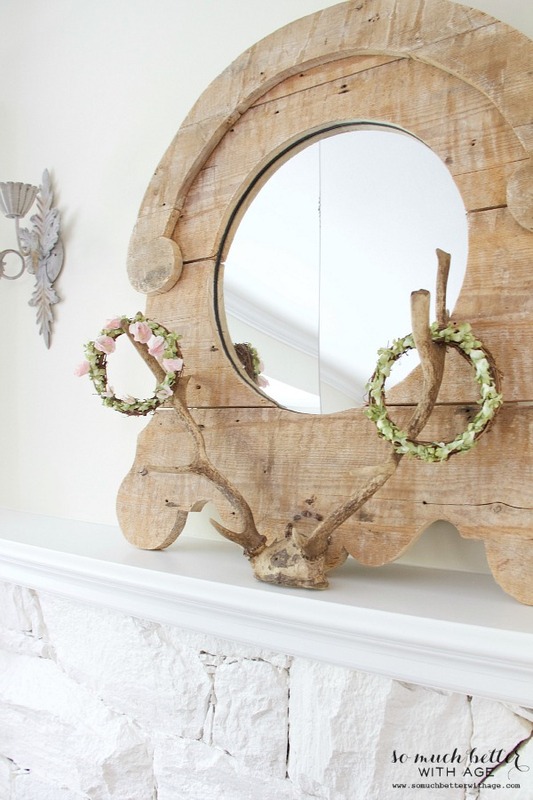 I love these decor items and your beautiful photos! 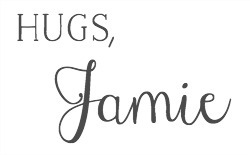 Hi, Jamie ~ I’m visiting from the Moonlight & Mason Jars Link Party. Gorgeous photos! 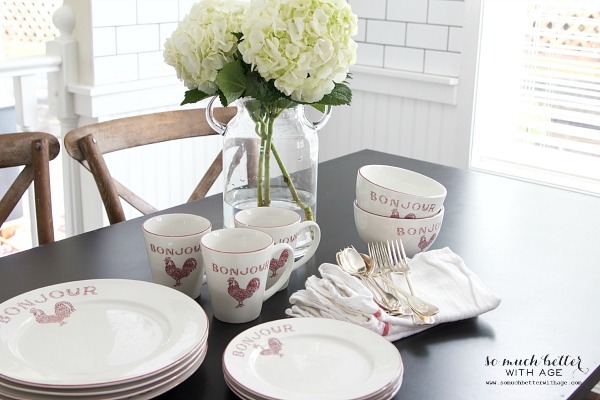 And I love those Bonjour dinnerware pieces. 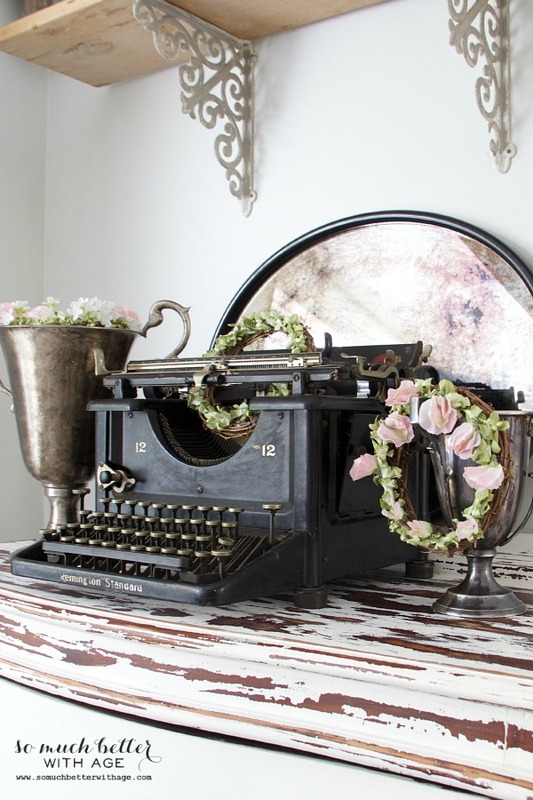 I also love the springtime floral crowns — especially the one on your vintage typewriter. Thanks for sharing! Thanks for being here, Tiffany!